Live recording by Lena Snetkova. English translation by Sophia Khodorovskaya, Sonya Luzina, Julia Bezbakh and Inna Farington. Slovak translation by Danka Čolláková. 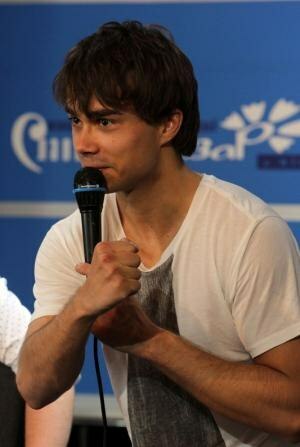 Alexander Rybak: “I don’t complain about anything!” – The press-conference in Vitebsk 12.07.2012. The project “Star Hour” at the 21st International Art Festival “Slavianski Bazaar in Vitebsk” has changed greatly. First of all journalists didn’t see a constant host Victor Tatarsky. This year Sergei Shustitsky and Alexei Ostudin will represent the stars by chain. By the way, as the Honored Artist of the Russian Federation, a famous composer and TV host Sergei Shustitsky stated at the opening of the first meeting of the International Press-center, he is going to lead the program “Star Hour” being in the shadows, allowing the stars to communicate with journalists. Sergei does not like scandals, he is for a good will, moreover, the format of “Star Hour” will be strictly regulated because of TV recordings. – Sasha, do you want to become a father? – No, I’m working hard not to become him!